Upon completing a full day at the temple, Elder Wilcox and his wife, Viva May, who serves as matron in the temple, drove to Salt Lake City to meet with President Hinckley who called him to be a member of the First Quorum of the Seventy. Elder Wilcox is no stranger to Church service. Along with his call as the Ogden Temple president, which he and his wife refer to as “a heavenly call,” he has served as a bishop, a stake president (for fifteen years), twice as a Regional Representative, and as president of the Indiana Indianapolis Mission. It was after returning from Pittsburgh that Elder Wilcox decided to ask Viva May Gammell, a young woman from his home town to be his eternal companion. “My mother had always told me that Viva May brought out the best in me, and indeed she does.” They were married on 17 July 1945 in the Logan Temple and are the parents of six daughters, Rona Lee Maughan, Stephanie Pickett, Christine Ritchie, Pauline Flitton, Sharon Christiansen and Carole Terry. They now have fourteen grandchildren. 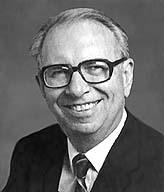 A graduate of the University of Utah in mechanical engineering with a master’s degree in architecture from the University of Oregon, Elder Wilcox practiced professional architecture from 1954 to 1974 when called as a mission president. He was instrumental in the design of both the Washington D.C. Temple and the Missionary Training Center in Provo, Utah. He also served as a member of the Utah House of Representatives for two years and as a member and chairman of the Weber County Planning Commission for ten years.